This is a topic suggestion on Slave Trade from Paper Masters. Use this topic or order a custom research paper, written exactly how you need it to be. European attitudes had much to do with the evolution and the prevalence of slave trading in the eighteenth and nineteenth centuries. Prior to the eighteenth century, most European visitors, traders and scholars of the largely still unknown continent of Africa put forth the concept that the known African people were viable partners, allies and equals. This concept of Slave Trade illuminated in Research Papers was starkly different than the myth that developed as the Europeans increased their presence on the continent and began to take the indigenous African people into slavery. That myth was that there was “a natural inferiority in Africans and an inherent failure to develop and mature”. This myth and the racial contempt it fostered toward the indigenous African people was eventually perpetuated and intensified to justify the material gain of the slave traders and the disdain that they felt for the slaves, as illustrated in Slave Trade Term Papers. The areas where the African indigenous people were taken from varied during pre-1700 and throughout the eighteenth and nineteenth centuries as European expansion in Africa began and continued to evolve. The most commonly recognized areas include but might not be confined to Gambia, the Gold Coast, Guinea, Sierra Leone, Upper Volta, Ivory Coast, Ghana, Togo, Nigeria, Cameroon, Gabon, the Republic of the Congo, Senegal and Benin. The destinations for slaves taken from these areas are just as varied and depend largely on the period in which their capture occurred. For example, early slave trade was marked by the sale or export of African slaves to areas in the Caribbean, limited areas in South America and even to areas in Africa itself. Destinations in the eighteenth and nineteenth centuries were increased remarkably to include much of the America’s, including the export and sale of African slaves to the American colonies. There are few comprehensive sources of statistics on the number of slaves that were taken out these areas as well as their ultimate destinations in the new world. For the most part, these numbers are either annual estimates offered for the number of slaves taken out of an area or total approximations. This investigation therefore will have to depend on the examination of what slave trade statistics exist, which are neither concise nor available from one or more comprehensive and scholarly sources. It is submitted however that the Portuguese, who were one of the first countries to establish trade with Africa as well as the practice capturing indigenous Africans for slave trade, focused on establishing the Senegal and Gambia as primary locations for taking slaves. The Portuguese captured and sold approximately 500 to 1,000 Africans annually from these regions prior the sixteenth century, and 2,000 annually until approximately 1530, the majority of which sold in other regions of Africa, Brazil or the Caribbean. It is estimated that the Portuguese captured and exported as many as 1 million Africans as slaves between the years 1580 and 1680. Overall, the numbers that have been submitted for the total number of slaves captured and exported to areas across the Atlantic include the conservative figure of fifteen million and the more extreme figure of about fifty million, with some scholars submitting that the numbers could actually be even higher. 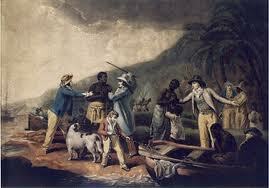 Paper Masters writes custom research papers on Slave Trade and discuss the slave trade globally.